The Makito X Dual channel HD H.264 encoder with 3G-SDI and Composite inputs. Supporting Multi Bit Rate (MBR) encoding. With 2 3G-SDI inputs and 4 encoding engines per blade, the Makito X single SDI carries forward the strong heritage of the Makito family with features designed to address the most rigorous video applications. The excellent picture quality at low bandwidth and the lowest end-to-end latency of the industry makes the Makito X platform ideal for internal broadcast applications. Combining KLV and CoT metadata support makes the Makito X ideal for Full Motion Video (FMV) applications in government and military. Moreover, integrated features such as snapshots, logo insertion, Selective Mute™, talkback, and powerful control interfaces enable advanced video network management in medical applications. Multi-bitrate (MBR) encoding to unicast, multicast, and RTMP enables administrators to direct many unique streams groomed to specific desktop and mobile viewers, set-top boxes, recorders, and Internet destinations. To maximize video quality over your network, the Makito X supports High Profile H.264 encoding. Tuned to excel in low bandwidth environments, the Makito X gives you twice the quality or uses half the bandwidth compared to other enterprise encoders. Matched with the Makito X Decoder to provide end-to-end latency as low as 70 milliseconds, the Makito X delivers pristine quality at sub-2 Mbps bitrates. The Makito™ X family of H.264 encoders and decoders deliver a complete end-to-end field-proven video solution offering confidence, security, and reliability with a mature feature set. 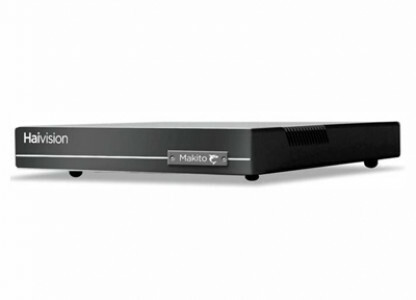 A complete product family, Makito X solves the most demanding encoding and video distribution challenges. Available as single appliances or mini-blades within rack mountable chassis, the Makito X encoders achieve remarkable density supporting up to 12 1080p60 inputs or outputs within a single rack unit. Haivision's Secure Reliable Transport (SRT) technology provides end-to-end security, resiliency and dynamic endpoint adjustment based on real-time network conditions to deliver the best video quality at all times. With SRT, you can optimise video streaming across unpredictable networks, like the Internet, by assuring quality-of-service when faced with packet loss, jitter, latency, and fluctuating bandwidth. Available within the Makito X encoders and decoders, SRT offers significant operational flexibility and cost savings over (or compared to) satellite or custom network infrastructures.